Life behind bars in Mallorca! No, The Boss and I are not currently residing at His Majesty’s pleasure in what some people dub ‘the Palma Hilton’. (That nickname for the island’s prison must really annoy Mallorca’s real Hilton hotel, Sa Torre Hilton near Llucmajor). Neither am I pouring foaming pints of beer for British holidaymakers in a lively Magaluf bar. I’m referring to the iron window bars, known in Spanish as rejas. They’re a common sight at the windows of houses in Spain and something that made an impression on me when I saw them, quite a long time ago, during my first visit to the country that is now my home. At the time I thought it would be horrible to live with bars at the windows, but I’ve now become so used to these things that I now couldn’t imagine not having them. Presumably many others feel the same as these traditional features are still incorporated into many new properties. They are first and foremost a security feature, enabling windows to be left open for fresh air, with a degree of protection from anyone who may wish to enter the house without an invitation. They also help prevent unsupervised young children from falling out of a window (or teenagers from doing an unauthorised late-night exit through their bedroom window to meet friends!). At one time, of course, many houses wouldn’t have had windows fitted with glass (which is still quite expensive on the island), so bars in the window space would have been essential as a security measure. We saw an example of this once when we stayed for a night in a townhouse in Pollensa: our bedroom window in this charming old property had shutters, but no glass! Thankfully it was a warm(ish) night . . . The downside of these things is that they do need to be painted from time to time to keep them looking good. And it’s a very fiddly job (and one that’s often bumped down the ‘to do’ list in our house as a result). The upside – apart from the security benefits – is that property insurance companies may give a discount on premiums if bars are fitted. 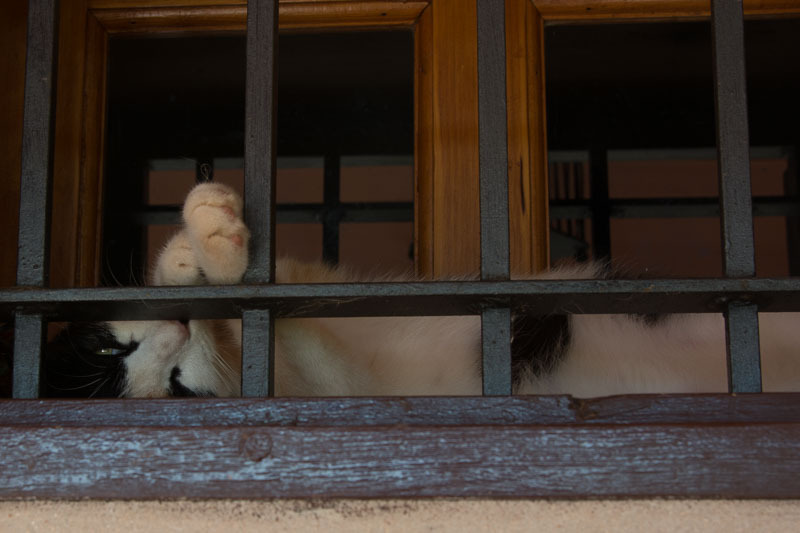 For our cats too, there seems to be a feeling of safety sleeping behind the bars. Pip certainly seems to take advantage of a ‘protected’ place to snooze away the daylight hours. Her favourite window – the smallest in the house – is in our small guest suite. She’s actually the only one of our cats that can fit into it. No need for a ‘do not disturb’ sign here . . . unless I’m around with my Nikon. These bars are very good for resting one’s feet on . . .
← How about living in rural Mallorca? Unfortunately they are nowadays necessary to protect your house from burglars which we learned the hard way some years ago. I subsequently made heavy welded bars that are locked in place when we are not there but can be easily removed at other times. No uninvited visitors after that!